On Nov. 26 Iranian Defense Minister Hossein Dehghan said that Russia's Aerospace Forces could once again use the airbase in Hamedan if the situation in Syria demands it. 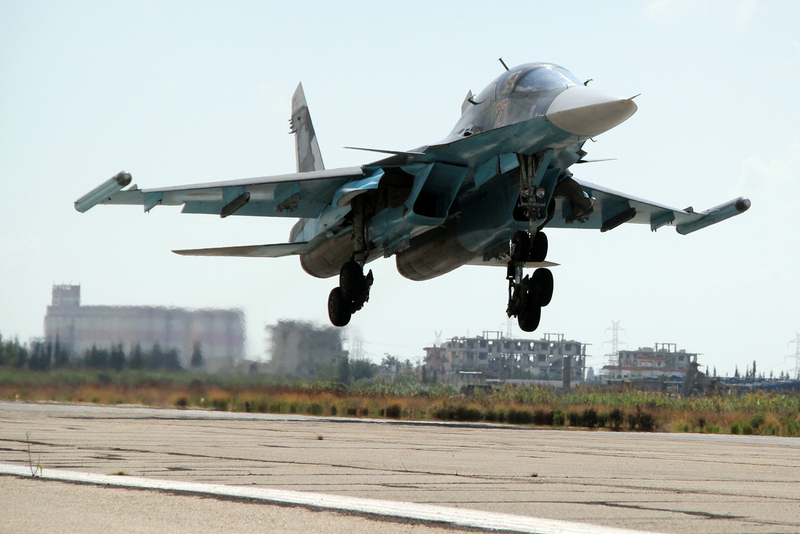 Photo: Russian Su-34 fighter bomber lands at Latakia airport in Syria. Iran has suddenly changed its mind about Russia using airbases on its territory. Although in August a political scandal broke out in Iran because of such use, now Tehran is inviting Russia's air force to return to its airports. It seems that there is a global political subtext to this change of attitude. Iranian Foreign Ministry Aide Hossein Sheikholeslam has said that Tehran is again ready to offer the Russian air force the use of its Shahid Nozheh Air Base in Hamedan if the situation in Syria requires it. "If Russia has the need and the matter is agreed to with the Russian side, then the Russian Aerospace Forces can use this base to carry out their military missions in Syria. If the situation in Syria requires it, then just like last time we are again willing to offer the Russian side the opportunity to have their Aerospace Forces use the airport for flights and refueling," RIA Novosti cites Sheikholeslam as saying on Nov. 29. He added, however, that Iran would retain full control over all the actions carried out on the base. "[Before,] we gave Russian planes permission to fly out of this airport to conduct airstrikes on terrorist positions in Syria, but we supervised all these flights, as well as the use of other aspects of the airbase," Sheikholeslam told Sputnik Persian. The fall of Aleppo or Trump's victory? On Nov. 26 Iranian Defense Minister Hossein Dehghan said that Russia's Aerospace Forces could once again use the airbase in Hamedan if the situation in Syria demands it. Then, on Nov. 28 Russian President Vladimir Putin and his Iranian counterpart Hassan Rouhani held a telephone conversation in which they discussed joint projects in the trade and economic sphere, as well as the situation in the Middle East, praising the level of cooperation in the fight on terror. Observers pointed to the fact that the telephone conservation coincided with what appears to be imminent victory for Syrian, Iranian and Russian forces in Aleppo, as well as with Tehran's decision to again invite the Russian air force to Hamedan. Americanist Boris Mezhuyev does not rule out that Iran and Russia's new reconciliation is related to Donald Trump's victory in the U.S. elections. "We still don't know who will obtain the key positions in his team, including that of U.S. Secretary of State and Secretary of Defense, yet Iran was one of the main subjects in Trump and his team's election rhetoric. For Tehran it is again important to find allies. Russia's position will be of crucial significance," said Mezhuyev. Anton Mardasov, director of the Department of Middle East Conflict and Armed Forces Studies at the Moscow-based Institute of Innovational Development, also alludes to the anti-Iranian rhetoric issuing from Trump and his team. "Although they do not have a clear strategy on Iran, Tehran has definitely heard their election promises to review the nuclear deal and has therefore decided to lean on Russia in the event of any new contradictions with Washington," he said. According to Mardasov, there are also three military reasons for reactivating Russian-Iranian cooperation. First, he says that if Aleppo falls it is likely that special attention will then be given to eastern Syria. "Assad really has to lay claim to his share of the pie in the Raqqa area, which has oil and a network of hydropower plants. In this scenario Hamedan is ideal for the Russian Aerospace Forces and their strikes in eastern Syria. Using this base drastically reduces flight time," he said. Secondly, Mardasov believes that talks are being held about increasing the Iranian presence in Syria: "Iranian Chief of General Staff has announced the possibility of establishing a naval base on the Syrian coast. This can also be the reason for the latest activation of Russian-Iranian talks," he said. Thirdly, it is possible that Iran is trying to convince Russia to choose a more aggressive way of ending the conflict. In particular, this means more active support of the Syrian government army and Shiite units in a potential attack on Idlib, as well as accelerating an assault on Aleppo's remaining districts. At the end of August a sudden spat between Moscow and Tehran forced Russia's air force to leave the airbase in Hamedan when Iran unexpectedly halted cooperation with Russia. According to the Kommersant business daily, Moscow had wanted to use Hamedan as a full-fledged military base for deploying its arsenals, but Tehran refused.